Talk about opportunism. It's not that I wasn't excited to have my youngest sister back in town for a few short weeks, and it's not that I didn't want her to know that we're glad to have her here. It's just that lately I might as well be spring loaded for the speed with which I launch into "bake like there's no tomorrow" mode. If there's an opportunity for me to don my apron and make a mess in the kitchen, I'm there, and making such a mess that it spills out into the living room, with cooling racks on the dining room table and bags of sugar and flour on the table by the front door. Carpe diem indeed. It's more like carpe diem, carpe opportunitatem, and if it's a rather involved project, carpe alterum diem. But this post isn't about my ever-more-maniacal baking fervor, and it's not a post about Sister #2--who, despite being awesome, is not something you can cook and eat, at least not in what we consider polite society. It's a post about cupcakes. In celebration of her return from Hahvahd Yahd, and in a nod to the fact that she, Sister #1, and I share a passion for cupcakes, I decided to make some for her. 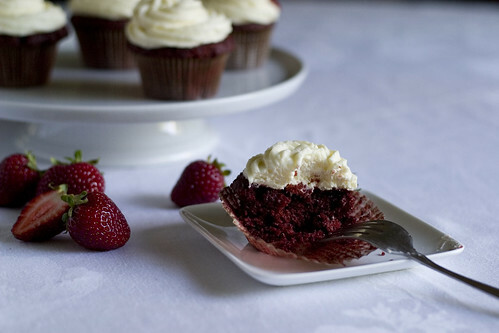 As much as I love full-sized cakes--especially layer cakes, in which you get cake and icing sandwiched together so that each bite sends you undulating from cake to icing to cake and back again... wait, where was I?--there's something fun and, to me, nearly irresistible about cupcakes. They are without question my favorite dessert, and the dessert I have the most difficulty in resisting* should one be placed in front of me--or within a 100 yard radius of me. First of all, they're cake, which should at least put them in the top five, if not seal the deal altogether. Second, they're miniature versions of their full-sized cousins, often re-imagined and crafted into petite fancies that delight the eyes as well as appealing to the taste buds. Somehow that tiny little canvas lends itself exceptionally well to inventive decoration. Third, they're cake. What's not to love?? Having established that cupcakes were the way to go, the only question was what flavor(s). I toyed with the notion of turning my Mother's Day cake into cupcakes, and will probably return to that idea eventually, but it didn't seem quite right. Then it occurred to me that what with Harvard's school colors being red and white--indeed, their mascot is the Crimson--there was only one kind of cake that would be truly appropriate: red velvet. This red velvet cake isn't as strikingly (or shockingly) red as many others out there. It owes its darker mahogany shade to a higher amount of cocoa powder. It's not quite a chocolate cake, though; the flavor dances around in the space between a yellow cake and a chocolate cake, neither plain nor overwhelmingly dark and chocolatey. Its hearty color belies its delicate texture--so delicate that extra care is warranted when handling layers of the stuff, and teeth or a fork sink into the cake with virtually no resistance. Although you'll see red velvet described as "tacky" or "vampy," this particular cake tastes and feels refined. Furthering that refined feeling, the icing takes a traditional cream cheese icing and adds not only mascarpone cheese for richness, but whipped cream for lightness. Icing lovers, rejoice: this one is heaven. I thought that I had found my true love in icing form with Swiss buttercream, and now this mascarpone cream cheese icing just might steal the buttercream's crown. Pipe it atop feather-light and subtly ruddy little cakes like these, and take some to welcome a loved one home. She'll be grinning an icing-laced grin from ear to ear. Place racks in the upper and lower thirds of the oven and preheat the oven to 350F/175C. If making cake layers, butter three 9-inch round cake pans, and line the bottoms of the pans with parchment paper. 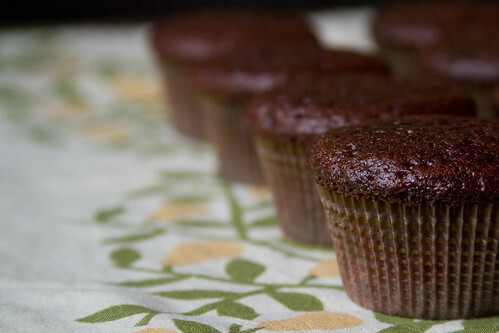 If making cupcakes, line three muffin tins with paper cups. Sift together the cake flour, cocoa powder, and salt and set aside. Combine the oil and sugar in a large bowl and beat at medium speed, using an electric mixer or a whisk, until well blended. Beat in the eggs one at a time, mixing well after each addition and scraping down the sides of the bowl as needed. Set the mixer on the lowest speed and gradually add the food coloring. Be careful if using liquid food coloring, as it might splash. Add the flour mixture and buttermilk by turns, beginning and ending with the flour. Scrape down the bowl after each addition, and beat just until the batter is blended. Mix together the baking soda and vinegar in a small bowl, and with the mixer running (or beating by hand), add the mixture to the batter. Beat for several seconds to blend well. Divide the batter equally among the pans or muffin cups (each cup should be 2/3 - 3/4 full). Bake until a sharp knife or cake tester inserted into the center comes out clean, about 40 to 45 minutes for cake layers and 20-25 minutes for cupcakes. 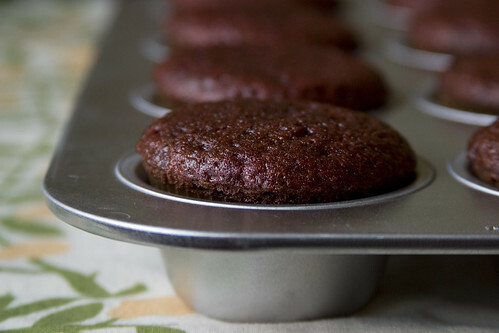 Let the cakes (or cupcakes) cool in the pans for 20 minutes. 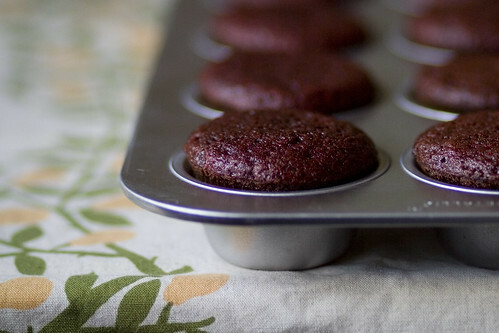 For cakes, invert pans onto cooling racks and peel off the parchment paper; for cupcakes, remove from pans and set to cool on racks. Cool cakes completely before icing them. Whip the cream, either by hand or with electric mixer, until it holds soft peaks. Cover and chill it while you prepare the rest of the ingredients. Combine the cream cheese and mascarpone in a large bowl, and beat until smooth and uniform. Add the vanilla and mix briefly; add the sifted confectioners sugar and beat to blend well. Stir about a third of the whipped cream into the cream cheese mixture, then gently fold in the remaining whipped cream. Refrigerate the icing until you are ready to ice the cake(s). This icing holds its shape nicely when chilled, but true to its ethereal nature, it does not handle heat well: it sags a bit when the mercury rises above warm room temperature. For best results, keep chilled or at cool room temperature. I don't recommend using it for cakes that will be sitting out in hot weather. Update: fixed the broken link to the original icing recipe. * Right between my local Sur la Table and the little cantina that sells my favorite chopped salad is a cupcake shop. It's been there for months, and after what seemed like an eternity of "being good," last week I finally caved and bought a vanilla cupcake with chocolate icing. I was psyched, but frankly, and much to my disappointment, it wasn't all that: vaguely stale cake with a not-very-tender crumb and icing that had more acidity than chocolate flavor. Even I can do better than that. Admittedly, one cupcake is a small sample size, but when some two-bit amateur can outdo your professional bake shop, you should probably step it up a notch or two. Hi saralee, thanks for stopping by. I used this page from Wilton as a guide, but I did it with two hands: one controlling the pressure and the other controlling the movement of the bag/tip. I don't know if that's the proper way to do it, but it worked for me. I feel like a bit of a fraud, actually, because I really don't have any piping skills to speak of, just reasonably good muscle memory. I botched most of the early ones (and some of the later ones), but once I got the correct motion down, I settled into a nice rhythm and it went smoothly and quickly. Just takes practice, I guess! And fortunately I made a ton of the icing, so I could afford for some to go horribly wrong. 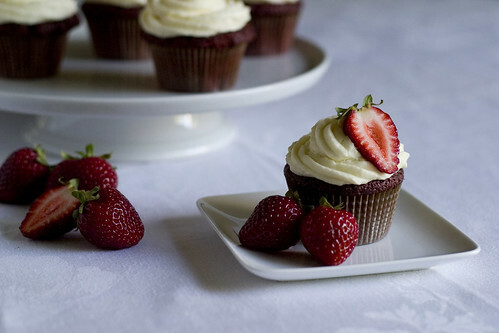 Oh my gosh.. these look delicious. And the flowers are the perfect touch... not overwhelming, not too simple. They're gorgeous! Thanks for sharing this recipe too. I love mascarpone and bet that frosting is amazing! Thanks, Megan! The frosting recipe is definitely a winner, or at least that's the consensus so far. 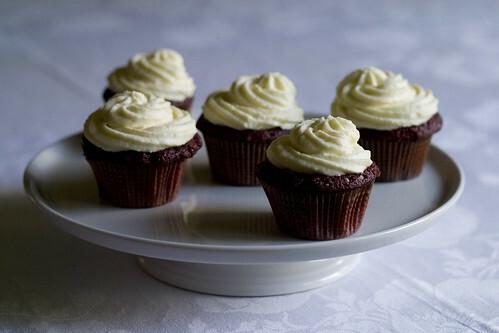 It's plenty rich, but lighter than a typical cream cheese frosting, which can be nice. A-mazing! 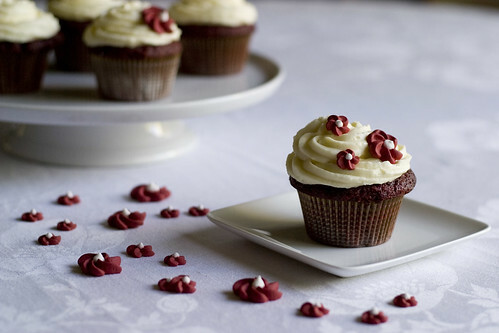 Your pictures are gorgeous and red velvet is my all time favourite. Now I need a snack! Cheers, Karine and SarahKate! I suppose the mess is smaller than it looks, but it's easy to take up the whole kitchen and then some when said kitchen is rather small (and already cluttered with overflow items that don't fit in the cabinets). Oh well. Love everything about this post -- pictures, writing and recipe! This is one of my favorites, and my youngest daughter almost always requests it for her birthday. I can't wait to try this version. BTW, as for professional cupcakes, I often find them to be lacking . . . and definitely dry. A keen baking friend of mine tried the much-praised Magnolia Bakery's offerings recently and she didn't think that they compared favorably to her own! p.s. Very Impressed that you also made the flowers yourself. Thank you, Bee! If your daughter likes a bit of chocolate flavor to her cakes, she might enjoy this one. Of course, if she's partial to the vivid red color, it might not be for her. The color in the pictures is how they looked in person... something to keep in mind. I don't often purchase cupcakes from bakeries (I do have some impulse control), so I wasn't aware of this tendency in professional cupcakes. Interesting! I might have to do some more sampling to verify this for myself. In the interest of science, of course. I was just so surprised that a shop that specializes in cupcakes--indeed, they sell only cupcakes--could do reasonable business selling ones that are so lackluster. 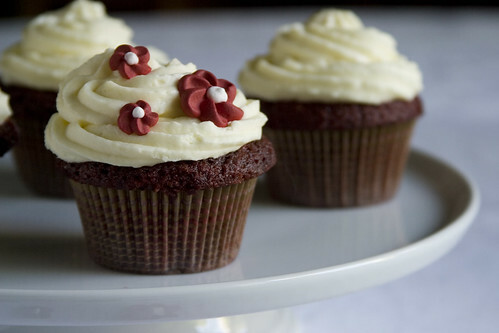 Perhaps cupcakes are so a la mode now that people will eat them regardless of the taste or texture? For what it's worth, in my experience, this red velvet cake stays nicely moist for days--even in the fridge. No dry cupcakes here! Little daughter was so happy to hear about this recipe! She is having a little party next week and they are definitely going to be on the menu. 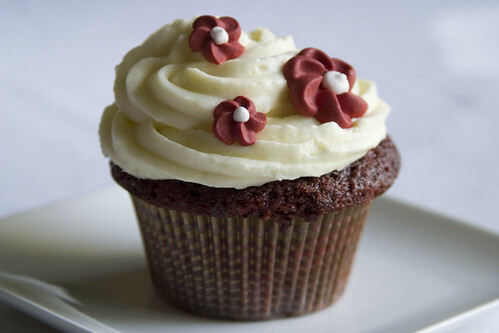 As for being able to charge exorbitant prices for dry cupcakes: Actually, I think that lots of people just don't realize how good homemade tastes. I know SO FEW people who actually make homemade cakes.